Ovarian cyst removal is surgery to remove a cyst or cysts from one or both of your ovaries. An open surgery requires an abdominal incision large enough that the doctor can see the cyst and surrounding tissue. It may be done instead of a laparoscopic surgery if the cyst is large, there are many cysts, or complications develop during a laparoscopic surgery. An incision will be made in the abdomen. The abdominal muscles will be separated and the abdomen will be opened. Next, the cyst will be removed. In some cases, a sample of tissue will be removed for testing. 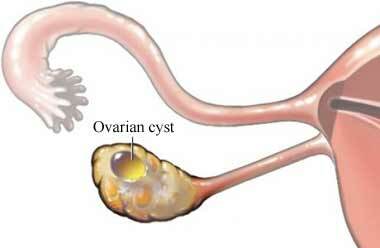 If cancer is found, 1 or both ovaries (if cysts are on both ovaries) may be removed . Lastly, stitches will be used to sew the abdominal muscles. The incision will be closed with stitches or staples. You will have abdominal pain and discomfort for 7-10 days. You will be given pain medication. Avoid strenuous exercise until your doctor says it is okay. Do not resume sexual activity until your doctor says it is okay. You may need to wait 2 weeks. Follow your doctor's guidelines for ultrasound tests. These may need to be done if it is likely that the cysts will return. Ovarian cancer. EBSCO DynaMed Plus website. Available at: http://www.dynamed.com/topics/dmp~AN~T900705/Ovarian-cancer . Updated November 17, 2017. Accessed December 13, 2017.